AMEN happens to be the evil demiurge that corrupted ALL scriptures on Earth with his total control agenda. Also spelt AMON or AMUN, the name itself means "The Hidden One" - the invisible "almighty god" mere humans are expected to believe in and worship as a matter of faith. When Marduk (known as Ra in Egypt*) became dissatisfied with rulership of both Upper and Lower Egypt, he moved his operational base to Babylon where he began to plot his own rise to deific supremacy, while in Egypt he continued to be worshiped as AMEN RA (Ra the Unseen), making sure his priesthood was as corrupt and wicked as they come. 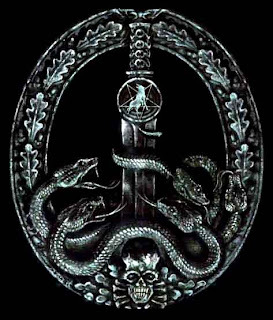 Marduk it was who systematically infiltrated all belief systems with his antisexual, antifeminine doctrines which gradually developed into the austere, humorless, warlike dogmas that are today the root cause of diseased patriarchal religions like Judaism, Christianity and Islam. The Evil Priesthood of AMEN RA is at work in ALL faiths - and their task has ever been to subvert the individual's ability to reconnect with his or her own Inner Authority - causing the masses ultimately to seek false comfort in official dogma and established institutions. Naturally the AMEN priesthood is most influential in modern times disguised as Academia. That's right, they have traded their priestly robes for professorial ones... and have effectively gained a monopoly on molding the psyches of the entire population through licensing and "legitimizing" all professions with their power to confer degrees and diplomas on those who meekly submit to their intellectual formatting. In Malaysia the Cult of Amen successfully disguised itself as the monoethnic, monolithic political party called Umno - sometimes called "Ameno" by its detractors. But beyond Umno, AMEN RA's deadly influence has spread throughout all levels of business and politics - and has co-opted all religious institutions, turning them into agencies of mind control. The unholy intention is to rigidify your thought processes. How can you tell when a belief system is basically Amenist? Primarily, Amenism is anti-Nature and anti-Life - and this fear of organicity manifests as erotophobia, which regards human sexuality as sinful and therefore taboo unless sanctioned by the blessings of an Amen priest (or civil registrar). AMEN RA regards himself as a "supernatural" being - and therefore has no love or respect for the natural environment. Ultimately, AMEN RA is obsessed with POWER OVER OTHERS - but, ironically, he has no power over his own irrational mood swings. When overcome by rage, AMEN RA literally goes berserk, runs amok, and transforms into the God of War, Moloch, who feeds on blood sacrifice. The Temple of Moloch on Earth is better known as The Pentagon. 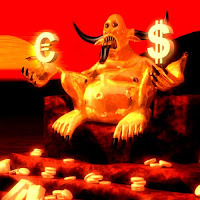 When at peace, AMEN RA takes the form of Mammon, the God of Money, and it is this deity that rules the Barisan Nasional - and all those who mistake property for prosperity, money for true wealth, and brute force for power. For more background on and insight into the psychic virus called AMEN, read Akhunaton the Extraterrestrial King by Daniel Blair Stewart (Frog Books, 1995). Are you an Egyptophile as well as Babylonopjhile. Wow! refer my latest blog 'The Sept16th Chronicles' and 'Wine, How Divine' satire. After Sept 16th, hopefully the old guard Amun priests, twb aka BUMNOS, will be forcibly retired. Visited Egypy in 2007. Most fantastic holiday of my life, esp Karnak & valley of Kings. Can I say that the 'The Evil Priesthood of AMEN RA is at work in ALL Institutionalized Faiths'. Their task is to subvert the 'Individual's Ability to Reconnect with his/her own Inner Authority'. This ability to reconnect is our primary quest in this world, that's why we were sent here.A minute of Reconnection is worth more than a thousand years of worldly pleasure(with the whole world's wealth at our disposal). The Ultimate Inner Authority is "The Almighty Lord of The Heavens and The Earth". (I better stop here before the JAWI/JAKIM look for me). Tipu lagi..lagi-lagi tipu..tak habis-habis ngan tipu.. dah dasar penipu..tipulah, apalagi selain tipu yang pandai dibuat penipu. Yang kesian..yang kena tipu! Boleh la belajar nak kenal penipu dan boleh juga belajar menipu agar tak nampak sangat macam penipu. Fortunately, I don't use Amen at all since I am not Christian. Hmmm..looks like our country is full of Amen Ra duplicates! I agree with Donplaypuks above - the graphics are indeed amazing. I don't know if you're being serious or pulling my leg here. It all sounds so believable, and yet, I kinda feel that it is tongue-in-cheek! I need to visit more here, before I decide. Or, I'll google Amen Ra and see what comes up! Went to the link you sent me, and got lost in it! From Amen to 666 to the anti-christ to the international medical symbol! Hahaha, and I'm not done yet. The internet is full of individually styled and formed opinions, interpretations, and misinformation. 1st of all, the gaps in history that are left after ancient scripture, science and archaeology can easily be filled in with ones own ideas and mixed with what is known, makes sense. However it does not make those presumptions any more true. The Amen, some believe were some of the original beings on Earth, a pre-Adam and Eve if you would, with a direct spiritual connection to the Most High. They were established to try and offset some of the works of the "fallen ones" . Some suggest that these were Atlantians, but there are other philosophies as well. Regardless, modern man was to have been formed through unguided souls with little connection to the Creator, yet through the Amen and their spirit, would help mankind connect and not be misguided by "fallen ones" whom had resolved to do their own bidding, not that of God's. This is where Adam and Eve (or the people who those name signify) come in. Given the Amen spirit in Eve, mankind was to repopulate with this new "connected spirit" and overcome the nephilim, and their offspring. 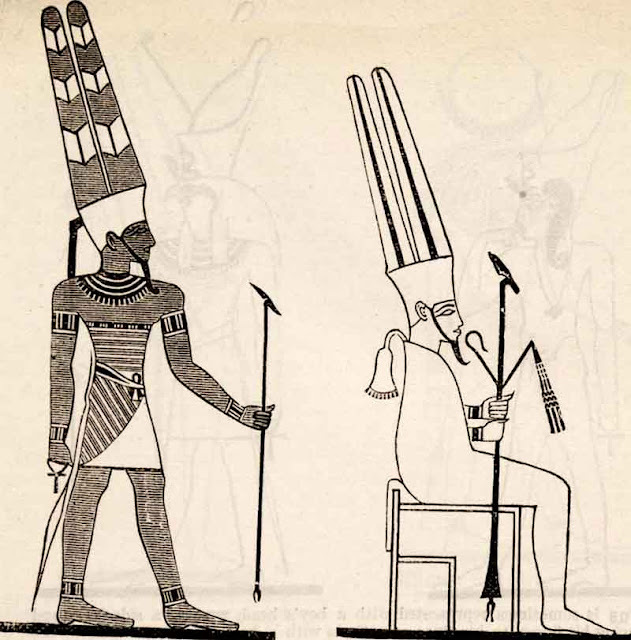 If you study egyptology, you will find that there was more than one Ra who appeared in ancient times, one who apparently did good, followed a possible impostor doing evil in His name. This parallels the story of Quetzalcoatl in his two appearances in America, 1st spreading goodness and truth, then war and human sacrifice. Remember that the fallen one's set themselves up to be worshiped as Gods as did many of their offspring. So naturally when the Truth and Light come unto man, the reaction would be to discredit it. The Amen got their name because they were created by the Most High whom simply wills things into existence, where as many creatures were the works of angels given the right to create beings on Earth. According to legend, the Amen sacrificed a part of themselves for the goodness of human beings, so the Amen were not to be forgotten for their sacrifice. name because, as I stated before God knows what you are going to say before you say it. And some of the best prayers and conversations with God are carried out with no words at all. ape kaitan ngn UMNO ? UMNO la. bukan ameno. haih. jgn la racist sgt. sy pun bukan pro umno. tp kan ade sejarah pasal UMNO tu. iorg bagi name UMNO tade kaitan pun gn mane2 ideology amenra ke amen yg awak paham. ini yg saya rasa. sorry if it too harsh. Popular among some theosophists, proponents of Afrocentric theories of history, and adherents of esoteric Christianity  is the conjecture that amen is a derivative of the name of the Egyptian god Amun (which is sometimes also spelled Amen). Some adherents of Eastern religions believe that amen shares roots with the Sanskrit word, aum. There is no academic support for either of these views. Note that the Hebrew word, as noted above, starts with aleph, while the Egyptian name begins with a yodh. Armenian word ամեն (pronounced /ˌɑːmˈɛn/) means every, however it is used in the same form for ending of prayers. Okay, okay.... Amen Ra, you can come out the closet now... game's over... no need to hide... we know you've been a very naughty boy.... just come out and go have a bath... you stink! Fix you some supper afterwards. Hi, I am new to this information and was wanting some clarity. I have been a Christian my whole life, I never say amen because something always Felt weird or off about it. I was wondering if you were saying there is no God or that there is one but that it is radically different from your good old Baptist God? I would love some guidance and clarity on this if you're willing. I am new to all of this, it's my first article I've read on this matter. Hello Tiarra & thanks for leaving such a refreshing, sincere & open-minded comment, which prompts me to respond immediately! This blogpost is a tightrope act wherein I attempt to shed new light on a very serious subject but in a light-hearted manner. So while I mean what I say about the devious pseudo-deity Amen/Amen Ra/Marduk/Moloch & so on) - you must bear in mind that most deific personalities carry several names, which have different functions - just as many of us use several nicks & User IDs when having fun on the internet. You know, Tiarra, the crux of the problem is that humans are constantly attempting to understand the whole of reality through our own minds, using linear language which operates in very limited & limiting ways. In effect, we coin words like "God" or "Love"... & then try every which way to arrive at acceptable definitions of what is essentially beyond definition & must be directly experienced. Remember, how we experience reality depends on what sort of experience we bring to the experiencing. For instance, a child of two will experience a seaside vacation quite differently from a 20-year-old. Same applies to a book: you may have read Alice in Wonderland at 8, then re-read the same book at 18; & later chanced upon it again when you turned 30. Each time you approached the book you got a whole different reading out of it, based on your personal experience. In other words, a discussion about the existence or non-existence of what people calk "God" will achieve little unless we first clearly state where we are coming from. Someone who spent a lot of time at church (or mosque) & reading the Bible (or Koran) will have different filters than another one who experienced the Divine (or the Diabolical or both) neurologically through spontaneous mystical initiations or the use of consciousness-altering substances. But let me just sum up what I personally have discovered after many decades - indeed, many lifetimes - of research: I have seen both the Divine & the Diabolical in the mirror. Yes, I have to admit that I know Amen only too well, because at some point I myself have been Amen. At the same time, I also know Jesus the Christ intimately, because I activated the Christ consciousness app at the age of 19. In other words, you have to realize at some point that all these stories, all these myths & mythologies by which humans attempt to understand the Mystery, they are ultimately about ourselves... our Core Selves... our Essence Selves! In lak'ech, Tiarra. I Am Another Yourself! Antares, I really like the way you put that and it very much resonates with my own experience. I have an extreme duality of nature, and through the acceptance of the darkness within me, and realising I was my own true enemy, I rediscovered my divinity, and became connected to a higher power. I had to journey through hell, but in doing so I found myself in heaven. It was the moment I finally admitted to myself I was desperately lost that I became found. As for explaining God, God is a word, yet words cannot describe God. Human language is a tool that is rather impotent when describing the divine, like trying to dig a hole with a plastic spoon, its not up to the job. I found the divine energy through suffering, and through mind expanding journeys with consciousness-altering substances. Primarily the mushroom, who is a masterful teacher. Through working up the courage to stare the darkness in the eyes, I saw a twinkling of light, like the stars in the night sky. I now know if it were not for the darkness, I would have been blind to the light, and so I unified the polar forces internally. Now life has become about expressing this energy and transforming myself to be a true leader, one who leads through example. A journey from being someone full of hatred and anger, to one with unconditional love and unity. 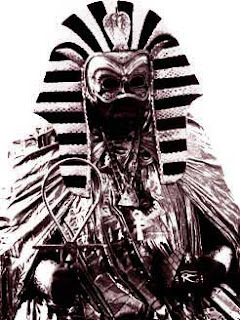 I happened to stumble upon this article through searching the deeper meanings of Amen, as during a past life and between life hypnosis session, I met my spirit guide who was named Amenhotep. Dressed as a pharaoh, he reminded me of our last life together (the last time he was on Earth with me) in Ancient Egypt. When you have felt that part of you that is eternal and immortal, the egos irrational fear of death melts away, a chronic pain that had plagued your whole life, gone in an instant. Anyway thanks for this post, I will check out more of the website. Seems silly to address you as "Vista of Vastness" & a bit rude to say, "Hey you!" but thanks for your friendly & intriguing comment. Your reference to Amenhotep prompted me to respond promptly. There were three Amenhoteps during the 18th pharaonic dynasty & I suspect the one who established contact with you as a guide may have been Amenhotep II, seventh in the royal succession. He was the grandfather of Amenhotep IV who discarded his name & replaced it with Ankhenaton (commonly spelt Akhnaton) meaning "eternally the Source." Happy remembrance & rediscovery & may your soul illuminate the way for many. The real name is Wayne…Vista is just my Google+ name I signed in with. That’s a great bit of information regarding Amenhotep, from what I understand of the “conversation” we had (I use that term loosely given how different it was to a normal human to human conversation) our job back then was to help sow the seeds for a one world religion that was to come later in the human journey. At the time we knew the people were not ready, but in the future they would be. Like a seed does not instantly grow into a plant but goes through a process that unfolds according to its blueprint. This is what I believe I am here to help with today, and despite the fact on the surface the world seems to be more in chaos and further apart than ever, there is something quite magical going on just below the surface of our perception. Just as the world is led to the brink of complete anarchy, it will be the catalyst that leads humanity into the kinship they really are. I believe behind the seemingly utter chaos there is a sublime order. Although there are many dark and evil people ruling, and so much fear…this is all part of the awakening process of humanity, for like a seed we must take root in the darkness before we are ready to strive towards the light. Keep up the wonderful work…what happens under the darkness must be brought to light. The only way we can overcome the need for darkness as a catalyst is to see it for what it really is, and we cannot do that until we are ready to see it as a part of ourselves. What can I say? Another classic! Thanks Antares, for helping clear my head. I needed this post like a bucket of icy water thrown over me and my hangover the morning after! To those who have no faith in the one an only true god. Yous are all decieved by the fruits of satan for it is written Moses bought the israeites out of egypt,and the fruits of satan worshiped so many false gods. Where were they when the only true God bought devastation apone them,believe what yous like for yous will be judged off your deeds at the end off this system of thimgs,AMEN,AMEN AND AMEN!!!!!!!!!!! This is excellent information, thank you. In all we do it is the intent we are judged by and this made great sense. it interesting how someone who claims to know truth is unable to communicate with love but all I see is agression the blogger wether we agree or not surely shows more love and compassion when communicating and I thanks him because he has given me clarity yes we need to know what we are sayin and not just be like sheep being led. This, while interesting in its own perspective, is very misleading to seekers of knowledge. To claim that a generic and well used word such as amen is always a proper noun describing an Egyptian god is ludicrous and unfounded. The word "god" itself is also generic, and in the original texts of Bibles is now substituted for may specific words, Jehovah, theos, elohym, archon, king, lord, adoni, judge, magistrate, and so on. All these are specific forms of gods. This was the kings translation, for the king is as well a god of his own kingdom (creation). The word amen is a actually a verifiably general term that is well defined in its intent and usage within the concordances and lexicons of the scriptures. To compare the two usages is absurd. at the end - so it is, so be it, may it be fulfilled. How you use a word and what it is applied to defines its meaning. Do not confuse the Bible with satanism and the gods of nations.